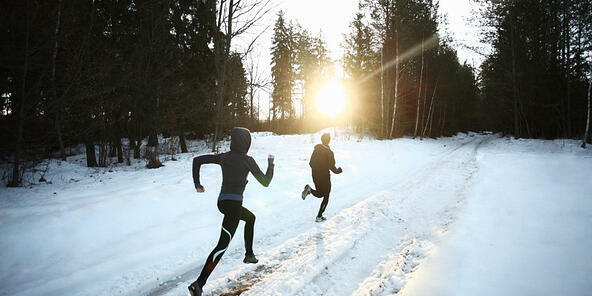 Many people make the mistake of dressing too warmly during a winter workout. When you exercise, you produce a considerable amount of body heat that makes the air around you feel warmer than it actually is, which can cause you to sweat. The problem then arises when your workout is over, and your body temperature returns to normal. All that leftover moisture can give you a chill, which can make you sick if you don't address it quickly. So what is the solution? Dress in layers! When you start to sweat, you can add and remove clothing as necessary. Avoid making cotton your first layer – it absorbs moisture and will keep your skin wet and cold. Instead, wear a thin layer of synthetic material that is designed to draw sweat away from your body (a.k.a. "moisture-wicking"). Then, add a layer of wool or fleece for extra warmth, and top that with a breathable, waterproof outer layer. Resist the temptation to pack on a heavy jacket or vest because it may cause you to overheat, especially if you’re engaging in an aerobic workout. If it’s particularly cold, you can wear a face mask or scarf to heat the air before it enters your body. Of course, it’s always best to experiment with a wide variety of clothing that suits your level of exercise intensity. Remember that stop-and-go activities, such as alternating walking and jogging, can make you more susceptible to the cold weather if you start to sweat and then cool off, so try to keep your outdoor workouts to steady-state ones. Your hands, feet, and ears are most vulnerable to frostbite, because in cold weather, the blood flow is typically concentrated in the middle of your body, leaving less for your extremities. To protect your hands, try wearing two layers of gloves – a thin layer underneath a heavy layer – so that you can remove the top ones if your hands start to sweat. For your feet, consider purchasing sneakers that are a little big so that you can wear thick thermal socks. Your ears are also important, so don’t forget to bring a hat or a headband! Working out in a cold rain can make you even more vulnerable to frostbite; if your clothes get wet, your body temperature may fall, even if you’re wearing multiple layers. So if it’s exceptionally cold and raining, do your workout indoors or skip it completely until the weather improves. Wind is also a problem. Even if you dress warmly and wear multiple layers, wind can make outdoor workouts unsafe because it can penetrate your clothes and remove any warm air that surrounds your body. A good rule of thumb is to choose an indoor activity if the temperature dips below 0 degrees Fahrenheit. If it’s particularly windy outside, do the second half of your workout with the wind at your back. That way, you’re at less risk for getting chilled after you’ve worked up a sweat. If you’re the type of person who enjoys an early-morning or post-work training session, be sure to wear reflective clothing to stay safe in the dark. Similarly, wear shoes that have enough traction to prevent slipping in the ice and snow. Chemical heating packs are also great ways to warm up your hands and feet. And of course, be sure to wear a helmet when skiing, snowboarding, or biking! Also, keep in mind that sunburns don’t just happen during the summertime – you’re especially vulnerable to the sun’s rays if you’re working out in the snow or at high altitudes. So, choose a sunscreen that has an SPF of at least 30 and opt for a lip balm that contains sunscreen. Dark glasses or goggles can also protect your eyes from the glare of sunlight bouncing off of snow. Hydration is not just for the hot summer months! You can become just as dehydrated in the cold weather as in the hot weather, but it may be harder to notice. Sweating, urinating, and breathing all release water from your body, so be sure to drink lots of fluids before, during, and after your workout. Fueling your workout is a little more complicated. You need to consume an adequate amount of food in order to have enough energy to exercise, and this fact is amplified during the winter – when also you have to generate enough body heat to keep yourself warm. The good news is that the digestion process does much of the work for you, since it creates heat as it distributes energy throughout your body. This process, which is known as thermogenesis, helps your body generate about 10% more heat after 30-60 minutes after eating compared to when you have an empty stomach. The key to fueling your winter workout is to consume nutrients that are digested quickly and easily, but provide enough energy for long efforts. Carbohydrates like oatmeal, bananas, pasta, and toast with peanut butter are great ways to warm up and fuel up for working out in the cold! The best way to stay safe and healthy is to stop a problem before it starts! Frostbite commonly occurs on exposed skin, such as your cheeks, nose, and ears, but it can also happen on your feet and hands. Watch out for loss of feeling, a stinging sensation, or numbness in your body. If you experience any of these symptoms, get inside as soon as possible and slowly warm the affected area. Be careful not to rub the area since that can damage your skin. If the problem persists, you should seek emergency care immediately. Just because it’s cold outside doesn’t mean that you should stop exercising! 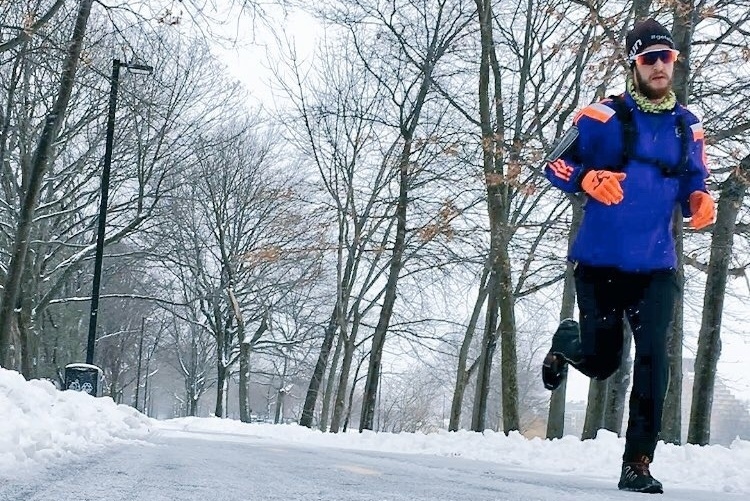 With a little extra preparation, your winter workout can be fun, safe, and satisfying!